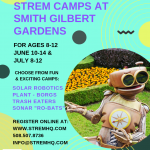 Smith-Gilbert Gardens has partnered with STREM HQ to bring you an AWESOME program for kids ages 8-12! 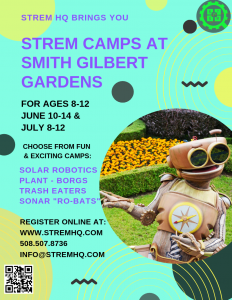 These make-and-take robotics activities fuse nature and conservation concepts with problem solving and cutting edge robotics technology for a camp experience like no other. No experience is necessary. All materials included. EARLY BIRD DISCOUNT: Sign up before April 15 for 10% off. Build your own solar powered Robots . Learn to build and transform your robot from a running beetle to a walking crab. Learn to build different robot modes, with unique movements and designs. Boys and girls will learn about solar energy and robotics from the comfort of their classroom- while having tons of fun. Learn to design and transform the robot into an amphibian. with alternative energy playing such a pivotal role, there is no better time than now to start children on the path to learning basic concepts behind robotics and renewable energy resources. Students enjoy challenges of building and testing their robots with crab races and making a wagging tail dog! Trash Response Team: Robot to the rescue! Students have fun creating mini robots that “Eat” Trash. Students will learn concepts of climate change and correlations of waste and climate change while they have fun making super cool robots.